This world used to be a garden full of life; from the flying Vadora to the deep-dwelling Dwarves � but that was before Vesh came. The world has been lost and only one city remains; the oldest city in the world � and the last refuge for all of us. Now... we fight back. 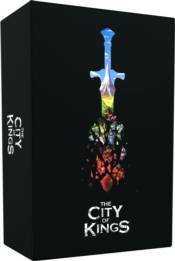 At its heart, The City of Kings is a complex puzzle featuring endless strategic battles. Each creature is generated from a pool of spells, characteristics and stats offering over 10,000,000 unique battle situations. There are no dice, damage is persistent, it�s up to you to customize your characters and work together to come up with a strategy to defeat whoever stands in your way.